Mutant: Year Zero works for me. I can’t think of a better and more communal way to warp and decay, to evolve and whiter. Death seems certain in this post-apocalyptic game but the story, the adventure along the way, will be interesting. I use the word “story” carefully too. Mutant: Year Zero successfully blends old school style mechanics – simple, straight forward and punchy – with a game designed to ensure more than just dungeon crawling through the ruined remains of cities. Each player has a mutant as a character and a say in the community they belong to – the Ark. The mutant is built by points and from one of a few character classes that the player decides but the mutation the character has is entirely random. The mutant gives the PC their edge, it is how they’ll survive in this Rotten world, and not using it will surely mean they’ll die. However, over time the use of the mutation will cause the character’s unstable body to whither, loosing attributes but gaining more mutations. The Ark is a group of about 200 mutants, looked over by The Elder, and isolated from the outside world. Among the ruins there’s nothing now except danger; beasts and the ever present Rot. The Ark has been safe for as long as the mutants can remember but there are no children being born on the Ark, food is running out and the Elder is dying. It is time for change. There’s an overarching meta plot that runs through Mutant: Year Zero. The book makes it clear when players should stop reading. The spoilers are significant. The PC’s mutants are significant too. It’s the PCs who, if they want, can venture outside of the Ark and look for artifacts from before the apocalypse, or food, or to deal with external threats before they reach the Ark. It’s also the players and their PCs that effect the development of the Ark. Mutant: Year Zero has a chunky ruleset that governs how healthy and evolved the Ark is and what projects are necessary to assist it. It’s entirely possible to play Mutant: Year Zero as an empire/community building game. There are rules for creating new communities and connecting them back to the Ark. Or perhaps I should say you could play Mutant: Year Zero as a world re-building game. Players might be tempted not to bother. If they don’t then they’ll find food hard to get. Mutant: Year Zero has simple but enforced encumbrance and substance rules. The two mean even the hardiest Mutant needs a place to call home that helps provide food. Given that players will find their characters rely on the Ark it means they’ll get caught up in the defense and politics of the Ark. Mutant: Year Zero ensures this by insisting that relationships are mapped out at character generation. PCs are created not just with relationships to other PCs but one hate and one protect relationship with NPCs. The game provides a bank of NPCs to help out with that in case the GM hasn’t got that far yet. These relationships are important. Here’s a snippet from the game; one the details how experience points are awarded. Did you perform a Day’s Work for a project in the Ark (page 103)? Did you explore at least one new sector in the Zone? Did you sacrifice or risk something for you PC buddy (page 22)? Did you sacrifice or risk something for the NPC you want to keep safe? Did you sacrifice or risk something to mess with the NPC you hate? Did you sacrifice or risk something to reach your big dream? The GM has the final say on how many XP each PC should get, but let all players around the table take part in the discussion. Mark your XP total in the check boxes on your character sheet. I began this review by saying Mutant: Year Zero works for me because I’ve come to terms with the way it skilfully enforces its own unique style and flavour on you. I can see why some gamers might object. 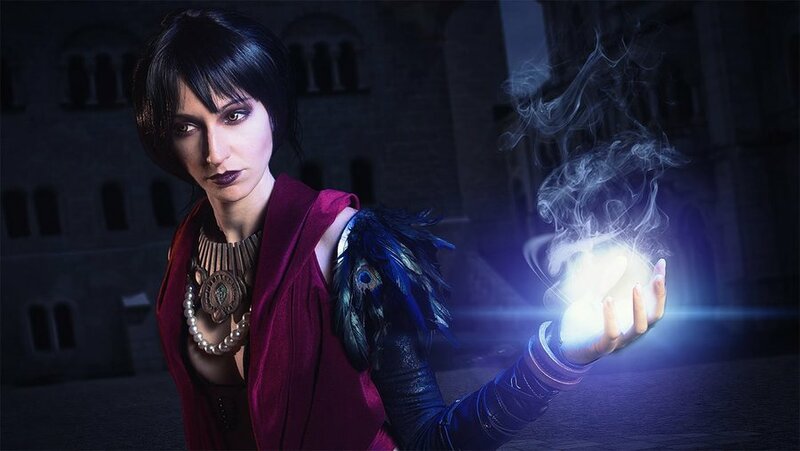 How would you react to playing a character that’s pretty much doomed to loose attributes and warp while the world of danger and politics rages around them. The GM, in this game, isn’t allowed to say “Nothing Happens” as a result of failure. Mutant: Year Zero is a game that insists on change and development. The biggest change for me – and the one that gave me the most trouble – is he use of special dice and cards. Mutant: Year Zero needs three sets of coloured d6. The official Mutant: Year Zero dice are yellow, green and black and have three symbols on them in addition to numbers. If you don’t have the official dice then normal d6 work, swapping 1s and 6s for the symbols but you need three colours. You need 6s to succeed. If you don’t get 6s you can roll again except those dice that rolled 1. Official radiation and mutation symbols make this more engaging than 6s and 1s. If you decide to “Push” your roll, taking that option to roll again, then 1s count against you. It’s these dice that’ll break you equipment and ensure the slow and steady destruction of your body. Each dice roll is a mini game of tactics. The cards are used for mutations and events. Cards ensure that PCs have different mutations and events are different. 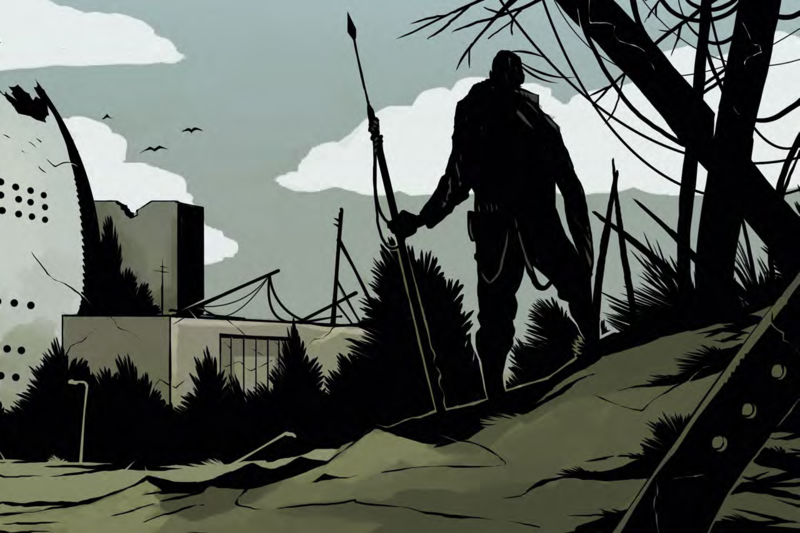 Events, in the spirit of Mutant: Year Zero, ensure that stuff is always happening – either to the PCs, the NPCs the PCs care about or the Ark. You don’t need the official cards, sold separately, fortunately as the core rules provide random tables as alternatives. The coloured dice tactics of each roll and the cards are two thirds of the physical elements that contribute towards MYZ feeling different from most RPGs. The final third is the use of maps. This is a game in which you count bullets and have rules for vehicles. It is not a game which encourages or needs the use of maps for melee or miniatures for combat scenes (although known Modiphius’ fondness for minis; official miniatures may come). It is, however, a game that makes use of maps to detail the zones around the Ark. Players scribble in details of the world around them as they explore. I’m a fan of post-apocalyptic games and as I fan I know the genre can be hard to get the most out of. There’s an incentive to survive, if played right, and that can put a dampers on adventure. Mutant: Year Zero conquers this by making communal adventure necessary in order to survive. It’s cooperative around the community but, if you want it to be, could be competitive among the PCs (even up to sabotaging community efforts). Mutant: Year Zero feels different; in a good way. It would be impossible to write up this review without also noting the look and layout of the game. The formatting is lovely with colour tones, effects and plenty of comic-book style illustration. This is a visual game. I love the appearance. My review is based off a DriveThruRPG download. 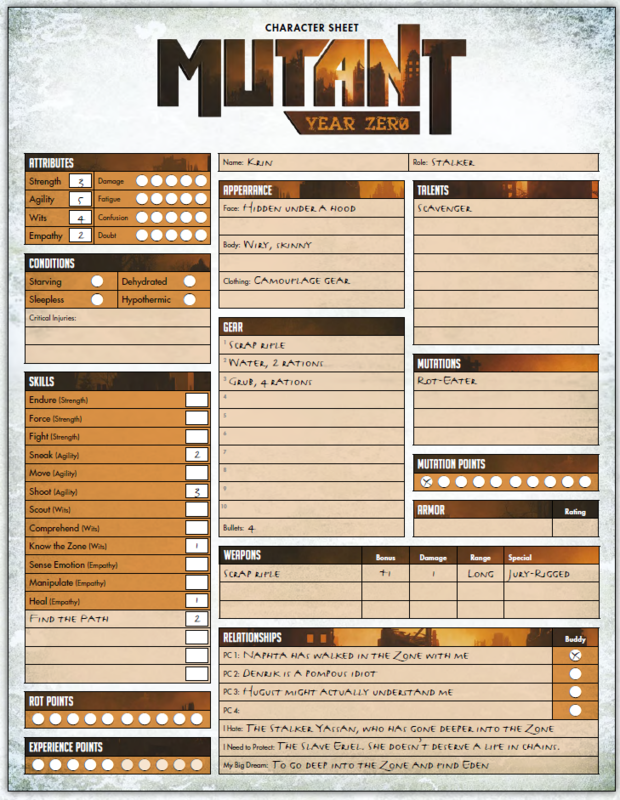 It comes with plenty of extra PDFs in addition to the core rules; Zone Maps, Zone Logs, The Dead Apple and The Big Smoke (two pre-made Ark zones), Clues to Eden, the Ark character sheet and a Character Sheet. I’d love to have a hardback edition as well. This feels like a collectible. 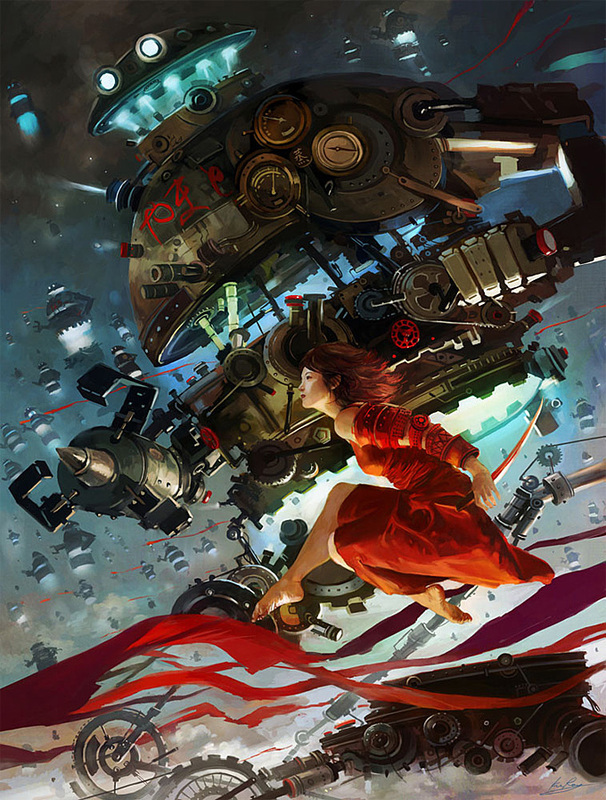 Oh, and… I just mentioned “Eden” in the list of extra PDFs. Eden is a reference to the meta plot that winds through the game. It’s one PCs can dig into and for GMs to way up or down if they want. Eden is a story the mutants have; a story of a better place. You see; although death seems inevitable in Mutant: Year Zero the game also does hope very well. Characters can address the food shortage (if only for a while) and can escape the Ark (and survive; for a bit). Life after the apocalypse is a struggle bit it’s a struggle worth having. Overall? I liked this one. Bring on the end of the world. 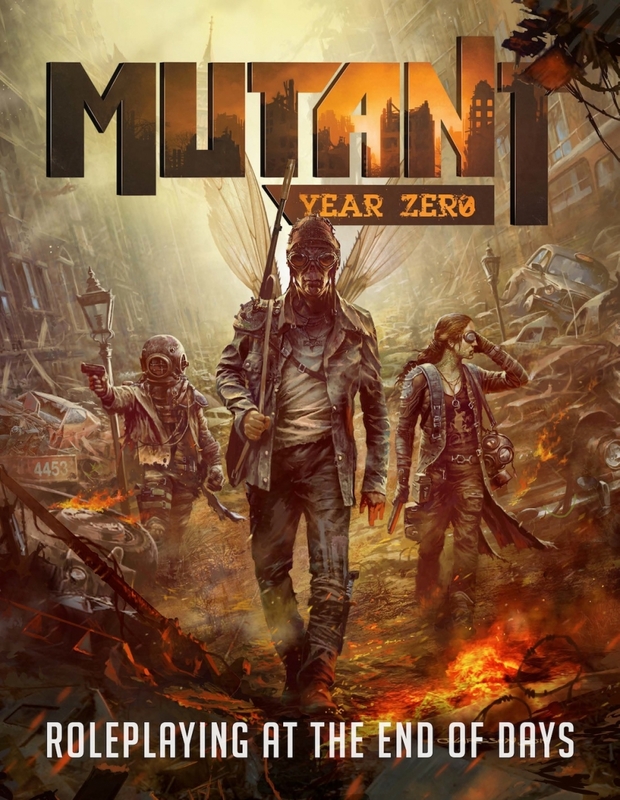 My copy of Mutant: Year Zero was provided to review.